RGB colour changing lighting creates stunning light effects which can be altered at the press of a button. Ideal for ponds and gardens. 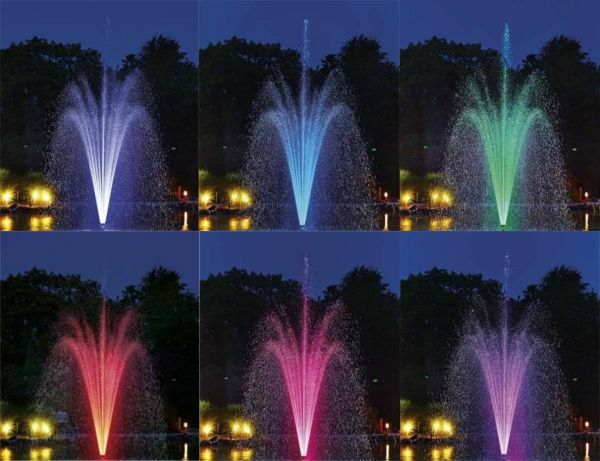 Fully submersible Colour Changing RGB Lights for your garden or pond. Our RGB lighting options are all high quality IP68 rated submersible spotlight units which can be operated via a remote control, allowing the user to select colours and scenes from a distance. RGB (Red/Green/Blue) spot lights using colour blending technology to create interesting atmospheres and environments which can alter at the touch of a button. 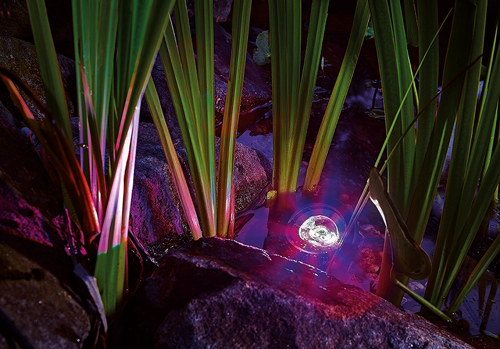 Controllable RGB lighting can be used to create mesmerising and unique illuminated environments to enjoy within the garden, water feature or pond. The majority of RGB lighting features dancing modes and colour phasing patterns allowing the lights to alternate colours, running on pre-set programmes. Water Garden Ltd offers high quality RGB lighting options which we have carefully selected to ensure a long service life and trouble free operation. The low voltage UltraLuxx RGB spot and deck lights offer powerful colour phasing illumination and several units can be connected to one transformer. The Profilux Garden LED RGB light sets are controlled via the Oase InScenio FM Master WLAN EGC which allows the user to operate them from an app on any Android or iOS compatible smartphone or tablet. They feature full colour selectability from a colour wheel, brightness adjustment, dancing scenes, and scene tempo adjustment. These are amongst the best domestic RGB lights currently available and they are certain to impress.